Nowadays, trend of T20 cricket is on the rise. This time Bangladesh Cricket Board announced the Bangladesh Premier League 2012. 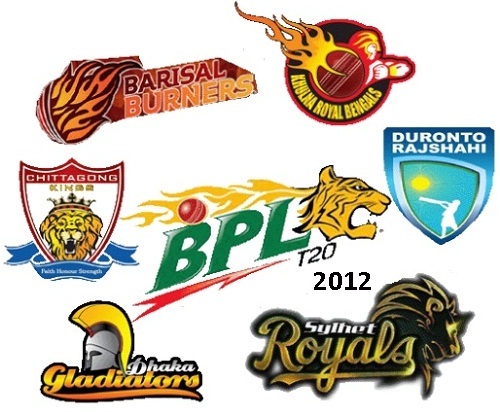 BPL 2012 has been started from 10 February 2012 and ends on 29 February 2012. Opening ceremony of BPL was celebrated on 9th February 2012. BPL 2012 is good for Bangladeshi fans as they can see talent of the local Bangladeshi players in hitting the fours and sixes and taking wickets in 33 Twenty20 matches of this tournament. This tournament will help Bangladeshi cricketers to improve their quality and perform more professionally. It is expected that BCCI’s IPL has inspired the Bangladesh Cricket Board. The main aim of shorter version of cricket, T20 is to improve the performance of players so Bangladesh can expect to build its players to perform well with the use of this tournament. Six teams are participating in this tournament and before reaching at semifinals, they need to play 30 league matches. Teams with highest scores will reach in semifinals and final match. All matches are being played at Sher-e-Bangla Cricket Stadium, Dhaka and Zohur Ahmed Chowdhury Stadium, Chittagong. The place Barisal is being represented in the Bangladesh Premier League by Barisal Burners team. For 2012 season, Sher-e-Bangla Cricket Stadium is the home ground for this team. This team has been bought for the price of USD 1.01 million by Alif Group. Captain and the Icon player of this team is Bangladeshi player, Shahriar Nafees. The coach of Barisal Burners team is Sarwar Imran. This team includes national team players such as Mominul Haque, Nazmul Hossain Opu, Suhrawadi Shuvo, Shohag Gazi, Farhad Hossain, Mithun Ali, Alauddin Babu, Al Amin, and Kamrul Islam Rabbi. Other players of this team are Chris Gayle from West Indies, Brad Hodge & Shane Harwood from Australia, Phil Mustard from England, Hameed Hasan from Afghanistan, and Rameez Raja Jr., Yasir Arafat & Ahmed Shehzad from Pakistan. The place Chittagong is being represented in the BPL by Chittagong Kings team for this season. The home ground for this team is Zohur Ahmed Chowdhury Stadium, for the 2012 season. SQ Sports has purchased this team for the price of USD 1.2 million. Bangladeshi player, Tamim Iqbal is the Icon player and Local player, while Mahmudullah is the captain for the team. Khaled Mahmud is the coach for Chittagong Kings team and Michael Bevan is the batting coach. This team includes national players such as Shamsur Rahman, Farhad Reza, Arafat Sunny, Faisal Hossain, Jahurul Islam, Enamul Haque Jr, Ziaur Rahman, and Sanjamul Islam. Other players of this team are Kyle Coetzer from Scotland, Nasir Jamshed & Shoaib Malik from Pakistan, Tom Cooper from Netherlands, Dwayne Bravo, Jerome Taylor & Lendl Simmons from West Indies and Muttiah Muralitharan from Sri Lanka. The place Dhaka is being represented in the Bangladesh Premier League by Dhaka Gladiators team. The home ground for this team is Mirpur Stadium for the 2012 season. This team has been purchased for the price of USD 1.05 million by Europa Group Limited. Bangladeshi player, Mohammad Ashraful is the Icon player for this team. Ian Pont is the coach for Dhaka Gladiators team. This team includes local players such as Nazimuddin, Aftab Ahmed, Tanveer Haider, Elias Sunny, Dhiman Ghosh, Anamul Haque, Mashrafe Mortaza, Nazmul Hossain and Mosharraf Hossain. Other players are Imran Nazir, Shahid Afridi, Rana Naved-ul-Hasan & Saeed Ajmal from Pakistan, Alexei Kervezee from Netherlands, Darren Stevens from England, Stuart MacGill from Australia as well as Kieron Pollard from Trinidad and Tobago. Sylhet Royals team is representing the place Sylhet in the BPL in this season. Sylhet Divisional Stadium/Mirpur Stadium is the home ground for the team in this season. This team has been purchased for the price of USD 1.06 million by Walton Group of Bangladesh. Bangladeshi player, Alok Kapali is the Icon player and Peter Trego from England is the captain of the team. Stuart Law is the coach for this team. Sylhet Royals team includes local players such as Imrul Kayes, Shuvagata Hom, Naeem Islam, Nadif Chowdhury, Arafat Salahuddin, Rubel Hossain, Noor Hossain, Talha Jubair, and Nabil Samad. Other players of this team are Kamran Akmal, Sohail Tanvir & Faisal Iqbal from Pakistan, Brad Hogg from Australia, Scott Styris from New Zealand, Frederik Klokker from Denmark and Gary Keedy from England. The place Rajshahi is being represented in the Bangladesh Premier League by Duronto Rajshahi team. Digital Auto Care has purchased the team for the price of USD 1.07 million. The Icon player and the captain for the team is Mushfiqur Rahim. Khaled Mashud is the coach for Duronto Rajshahi. This team includes local players such as Junaid Siddique, Ariful Haque, Mizanur Rahman, Asif Ahmed, Sabbir Rahman, Mukhtar Ali, Syed Rasel, Soumya Sarkar and Saqlain Sajib. Other players are Sean Ervine from Zimbabwe, Rizwan Cheema from Canada, Qaiser Abbas, Fawad Alam, Abdul Razzaq & Mohammad Sami from Pakistan, Marlon Samuels from West Indies and Imran Tahir from South Africa. Khulna Royal Bengal team is representing the place Khulna in the BPL. Sheikh Abu Naser Stadium/Khulna Divisional Stadium is the home ground for the team. This team has been purchased for the price of USD 1.06 million by Orion Group. Shakib Al Hasan is the Icon player and the captain of the team. Robin Singh is the coach for Khulna Royal Bengal. Khulna Royal Bengal team includes national players such as Maisuqur Rahman, Nasir Hossain, Marshal Ayub, Nazmul Hossain Milon, Saghir Hossain, Abdur Razzak, Dolar Mahmud, Shafiul Islam and Shahadat Hossain. Other players are Herschelle Gibbs from South Africa, Sanath Jayasuriya from Sri Lanka, Shivnarine Chanderpaul, Andre Russell & Fidel Edwards from West Indies, Dwayne Smith from West Indies, Niall O’Brien from Republic of Ireland and Jos Buttler from England. You can buy tickets for the Bangladesh Premier League Twenty20 competition from Dhaka Bank, and online at www.easy.com.bd. Tickets are available at 20 branches of Dhaka Bank from Monday, January 30, 2012. Online tickets are available from Thursday, February 2, 2012. The rights to sell the tickets at Tk 450 million have been purchased by Shihab Trading. The tickets are priced at range from 500 - 12000 Bangladeshi Rupees. The cost of General and North Gallery tickets is Tk 500, Club House tickets is Tk 3,500, International Gallery tickets is Tk 5,000 and each seat at the BCB Corporate House is priced at Tk 8,000.
when do we get the finals ticket?